This major project was led by the Office of Human Resources with support and feedback from the Staff Senate and President's Cabinet. The revision process began with Human Resources updating the existing handbook to reflect current practices and appropriate compliance and legal mandates. A revised draft was then provided to the Staff Senate for input. The Staff Senate convened the committee, reviewed the handbook and provided constructive feedback. Once the Staff Senate completed this review, follow-up meetings were held with Human Resources to discuss the Senate's comments. This draft was then presented to the President's Cabinet for final review. The Staff Handbook replaces and supercedes all previous versions of the handbook in its entirety and should be used as the current source of information regarding employment with the University. As a result of the topics brought forward to the Clerical Roundtable Event in the Fall of 2012, Staff Senators have conducted research on the topic of day care. A copy of the research composed can be found here. In the formation of a Staff Senate Spirit Award, renamed The Meg Cullen-Brown Magis Award, The University of Scranton Staff Senate has found a way to honor employees who exhibit our Jesuit ideal of “men and women for others.” The award will be bestowed each month to a deserving nominee recommended by our campus community. If you witness a staff member offering excellent performance of their duties or care above expectations, please recommend this individual for this award. Magis Award recommendations can be made by completing the nomination card and forwarding it to peggy.doolittle@scranton.edu. You could also print it out and send to Peggy at her office in Louis Brown Hall 401. In addition, nomination cards will be available to Facilities Operations and University Police personnel through their supervisory chains of command. The Staff Senate Recognition and Excellence Committee will review the nominees each month and award the deserving employee. The award in addition to recognition, entitles the individual to a certificate for $50 worth of complimentary food at our fabulous University food service outlets and a reserved parking space for their award month in the Parking Pavilion. Each monthly winner is also invited to the Senate Recognition luncheon in May to receive a certificate of appreciation. We hope you will join the Staff Senate in recognizing and nominating employees and share our excitement for giving individuals the opportunity to be acknowledged for their outstanding efforts on behalf of our campus community. 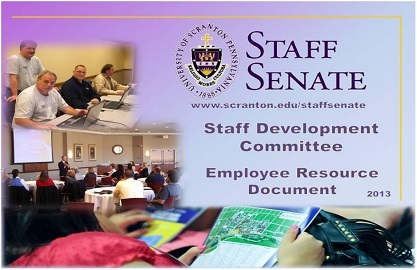 A Community Group in Desire2Learn (D2L) titled Clerical Staff Support Network (CSSN) is available as a means of communication among clerical staff at the University of Scranton. It was developed by clerical representatives of the University Staff Senate. It is in early development, and comments, suggestions, questions, and assistance with this initiative are very welcome. The purpose of the CSSN is communication of best work practices and access to help for functions unique to clerical workers. One goal of the group is to identify training needs, and then clearly define those needs so training is targeted and specific. Another goal is development of a resource library to enable clerical staff to improve their own efficiency. Several early outcomes since inception of this group include several online discussions about training needs and support for functional questions. A successful 'lunch-n-learn' information session about budget systems in Argos and Banner took place as a result of input. The data collected from the online forum discussions, lunch-n-learns and Clerical Roundtable functions are hoped to be useful in ongoing planning and implementation of training. On Friday, February 15, 2013, University Dining Services announced the creation of a new “debit” meal plan for Faculty and Staff. Open an account by simply going to the Bursar’s Office and making a deposit. Each $100 deposit will be matched by a 6.0 % bonus added on. The account may be used at any of the eight dining locations on campus. This “employee debit” account can be accessed by informing the cashier and presenting your Royal Card. ALL University employees and ARAMARK and Follett employees are eligible (exceptions below). Full time students are not eligible. Resident students are not eligible. Funds will remain in the account indefinitely. Refunds can be requested (6% add-on bonus will be not be refunded). Save up to 6% on all dining on campus by opening an account. The Staff Development Committee works on maintaining the Employee Resources Document. First released in the fall of 2011, this document is a collection of University resources, gathered together for the first time, intended to help new and seasoned employees find the contacts, forms, procedures and instructions necessary for conducting University business. It is a live, working document that will be updated and maintained as necessary. 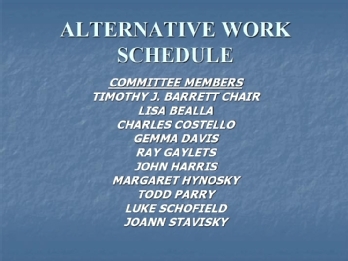 The Alternate Work Week Ad-Hoc Committee researched alternative work schedules and summarized their findings and recommendation into the Alternative Work Schedule presentation.